Imagine something wonderful, like chocolate chip cookies warm from the oven. Pretty great, right? 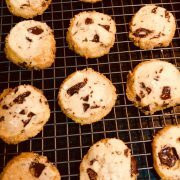 But what if those cookies were made with a secret recipe that included fragrant, browned butter, a turbinado sugar border, and fleur de sel from the coastal town of Maldon? It’s chocolate chip cookie goodness, elevated to a whole new level. That’s what we’ve spent the past year creating for you: the all new RFPMatch. It’s your matchmaker for all things funding—elevated! Its new features make it even more relevant, more accessible, and more powerful. Something wonderful, taken to a whole new level. 1. RFPMatch ONDemand, a portal that is your virtual assistant providing you precisely aligned funding insights, timely grant opportunities, and actionable state-specific funding recommendations. The portal is full of curated resources to help you find the right funding opportunities for your education partners. Register for free to peruse the site and gain access to a limited number of resources–or purchase a subscription for full access to a trove of information. 3. GrantsAlert, a free site for educators with regularly updated grant listings and opportunities to help make funding more accessible to schools. We offer this site, completely free of charge, because the heart of RFPMatch beats for educators. We are also thrilled to announce that RFPMatch was selected as a SETDA Emerging Partner. This distinction showcases our ability to collaborate with education solution providers to shine a light on the latest funding trends and resources. Learn more about our new partnership with SETDA here. We hope you enjoy exploring the new, elevated experience you’ll discover at RFPMatch. Let us know how we can be of service to you!